VSE of Squalor coming right up! LOL okay yeah busted: I said I’d have this important content for you in January, and here we are in February, but I have a good excuse, I swear. I learned, to my horror, that no one was washing their Instant Pots and so I had to readjust my entire edit schedule to save the boss from a lifetime of eating garlic quinoa-smelling hard boiled eggs. Today is the day that every gym rat hates: January 2nd, a.k.a The Day of the Resolute. But now the time has come for me to save your clean-but-oh-God-still-rank-smelling workout clothes from bad laundering practices. Before we do this thing let me say this: A lot of the best practices vis-à-vis washing the clothes we wear when we exercise are counterintuitive, and so you shouldn’t feel at all bad if you’ve been, say, treating your yoga pants to a proverbial boiling. But also you’re going to stop doing that because that’s, like, one of the big rules of washing gym gear. Heat is the enemy! Also fabric softener, but we’ll get to that. One big issue with managing odors in workout clothing is that, unless you do laundry every single day (the dream! ), those sweaty, damp togs have to sit in a heap in your laundry hamper. Or on your floor. But let’s not talk about how you throw dirty clothes on the floor, it actually upsets me too much and we still have a lot of ground left to cover. Speaking of ground to cover! I tackled the question of what to do in between the wearing and the washing of your gross gym clothes a few columns back so I’m gonna leave that here and move along to the part where we do the washing. Whee! What Do I Do With My Smelly Gym Clothes In Between Laundry Days? The dirtiest part of your workout clothes is the inside — think about all that dead skin, sweat, and suchlike that builds up while you’re giving it to the treadmill! Yeaaaah. (Also sorry I made you think about that.) All of that buildup is what contributes to the nasty smell that sometimes doesn’t go entirely away even after the clothes have been washed. Turning the clothes inside out before laundering them will help to get them cleaner, by exposing the most soiled part of the fabric more directly to water and detergent. Rule 3: Stop Using So Much Detergent! It feels like it should be right that more detergent = cleaner clothes. But no! Actually, the opposite is true; using too much detergent leaves behind sudsy residue, which contributes to the development of odor-causing bacteria. Wild, I know. Science is crazy, you guys! A thing that detergent manufacturers don’t do is make it easy to figure out how much detergent to use, which is annoying AF. It’s always a good idea to check the dosing instructions on the package, since oftentimes simply using the cap or scoop and assuming that will be the right amount can lead to wildly overusing soap. This is especially true if your detergent formula is a concentrated one. It’s also helpful to know this: For dosing purposes, a “regular” load of laundry is 6-8 pounds, and “large” load is 10-12 pounds. There are two things working against you when it comes to ensuring your favorite yoga pants come out of the wash as clean as possible: First, because they’re often made from synthetic fibers, they retain smells differently from natural fibers like cotton. Then, also, there’s just the fact that we sweat more in our workout gear than we do in our other clothes. Given that, when it comes to washing workout gear like basketball shorts, sports bras, compression pants, etc., regular detergent sometimes isn’t enough to blast through the smells. Which means it’s time to consider an odor-eliminating laundry booster — a product you use in addition to your regular detergent — like Zero Odor or Lysol Laundry Sanitizer, or a straight-up sports detergent, which will have an odor-neutralizer built right into it. Want some suggestions? I gotchu, boo. If you’ve ever experienced the smell of New York City in August you know this truth: Heat amplifies odors. It’s also true of that synthetic fibers don’t love to be exposed to heat because it will cause them to break down more quickly. 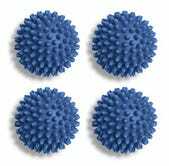 Given that, please opt to wash your exercise gear in cold water, and to machine dry using the low- or no-heat setting. Even better! If you have the set-up for it, opt to air dry the stuff. That will both prevent the smell amplifying high-heat drying can have, and help to lengthen the lifespan of what tends to be pretty pricey garments. Rule 6: NO FABRIC SOFTENER. NONE. NEVER EVER. NOPE. PUT THE FABRIC SOFTENER DOWN. STEP AWAY FROM THE FABRIC SOFTENER. Not the liquid stuff that goes in the washer! Not the sheets that go in the dryer! Nine times out of 10, when someone comes to me complaining that their gym shorts smell like last week’s WoD even after washing them, the problem is that they’ve been using fabric softener. And here’s what that’s a problem: The stuff — and I hope you’re reading that in exactly the derisive tone I’m using in my mind — in both the liquid and the sheet form, leaves a coating on clothing that, when it comes to synthetic fabrics, makes the fibers, like, impenetrable to water and detergent. So basically, fabric softener creates a barrier that keeps odor-causing bacteria trapped in your clothes, which is why they’re coming out of the wash still all funky-smelling. If you’re worried about losing, well, softness by giving up the fabric softener, try switching to dryer balls, which will help to fluff clothes up and also speed up drying time, and will also serve to cut down on the amount of heat you need to expose the clothes to. It’s a win-win. 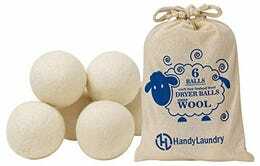 Also because one of you asked the last time I talked about dryer balls, yes non-wool options exist! How Do I Clean My Disgusting Yoga Mat?